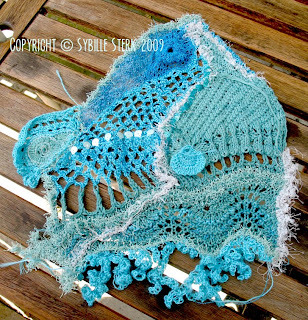 I've been labouring on the patio in the shade on my mermaid shawl. Here's a quick preview of what I've done so far. 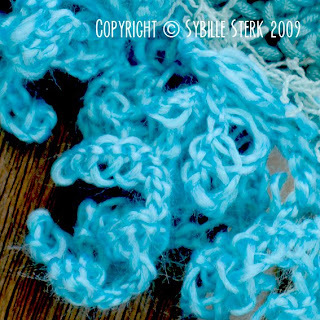 I've used a whole range of yarns in a myriad of shades- from a silvery white to dark blue to every shade of turquoise and teal. The textures range from fluffy kid silk mohair to feathery to silky to glittery to sparkly. 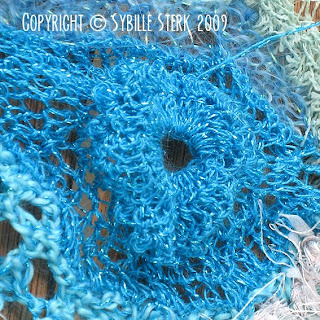 Some of the shapes are done separately and then attached to the shawl, others are knitted or crocheted onto the main body of the shawl. Some parts have been embroidered, to others I have added sequins. There are pearls and beads yet to come. At the moment the shawl is only about a fifth of it's final length... so a lot more to go. 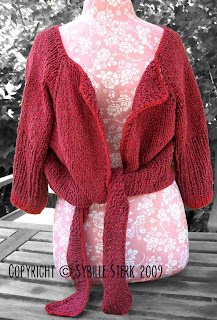 This shrug took me some time, especially as it was supposed to be a cardigan! I used a pattern but a different yarn which changed the shape. and so I ended up with a cardigan that just didn't look like it should... 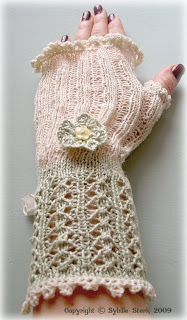 Here's a link to the original pattern. The yarn is Rowan Summer Tweed in Smolder and a little of a merino/mulberry silk yarn in a lovely dark red. The Rowan Summer Tweed is half silk half cotton and has a lovely texture. 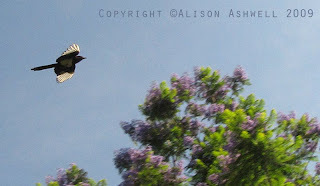 Make sure you have a look at Alison's blog - lots of great photos and amazing stories to go with them. Remember the illustrations I did a while back? Well, some of them were accepted for the Big Book of Contemporary Illustrations and I had an e-mail today saying that the 'on-the-shelf' date for the book is going to be sometime in September. I can't wait to see the finished book. Here's a link to the book entry on Amazon. ... I am also working on an illustration and bought myself some mini canvasses to play with, probably with acrylics. I thought I'd start small (the canvasses are only postcard size). I also got myself some oil pastels to play with.... watch this space. :-) Not that I am bored with painting digitally but sometimes it's nice to have a proper brush and paint in your hand (and not just to paint the walls with). I am going to pass on the award to Toby at Natural Attril. He's a fantastic designer, not only for one so young but on any account. I greatly admire his focus and his business acumen, the latter of which is rare in artists, and he is lucky to have a talented mum who supports his ambitions and creativity. Now my computer is finally back and in working order, I've been distracted designing Caroline's website. Check it out here. Caroline has signed up for this year's Cambridge Open Studios and was desperate to have her website up for people to view her art on the web. The weekend was gone in a flash with work on the allotment, including shifting lots of paving slabs in preparation for a shed. However, despite the hail we had yesterday all the vegetables are looking great (except for my poor melon). We even discovered a gooseberry bush at the back of the allotment with lots and lots of fruit, which I turned into three large jars of jam. The computer is ALMOST back to normal. Got most of the programs installed but it took much longer than anticipated.... but thanks to the master of all arts black and mysterious I am getting there. Sigh. That'll teach me not to rely on my hardware. I am really frustrated, because the hard drive was only just over a year old and I'd expected it to last longer. Never mind. I am back and here are my latest creations. .... so I made a little bath for the yarn and because the original colours of the yarn were different I got various shades of jade green. Reminds me of a mermaid. Not quite sure what I'll make with it. 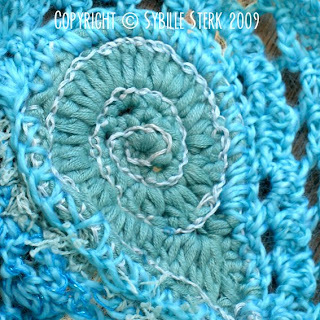 I am playing with the idea of making it into a freeform shawl - freeform is a mix of shapes knitted, crocheted and various other fibre arts mixed in to create a garment or piece of art that is not restricted by a pattern. The other option is a top.... Hmmm. I have almost 300g (nearly 600m ) of the lovely yarn and I am sure it will turn into something lovely. I quite enjoy the whole yarn dying process. 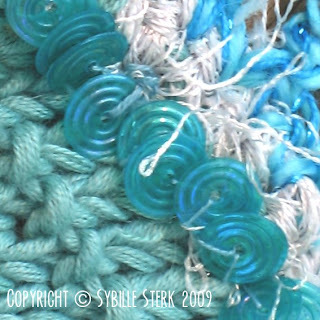 It's amazing how different various yarns react to the dyes and the depth of colour that can be achieved. 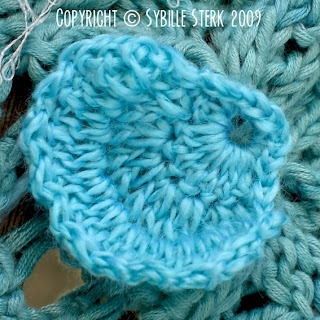 I particularly like the fact that the colour is often not quite uniform which adds more interest to the yarn. I got myself a couple more batches, this time of undyed yarn, which I'll dye hopefully next week. Unfortunately, my hard drive is totally dead. So I won't be able to get any data off it, which is rather annoying as I have no backup of my e-mail or bookmarks. The bookmarks have been collected for months and months so I'll have to try and remember the important ones. 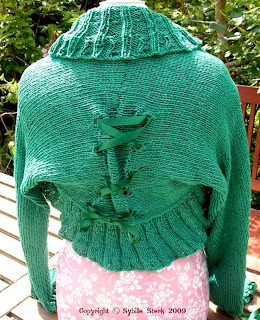 I've also lost my collection of online knitting patterns and the ones I downloaded. The worst bit is that this means I cannot paint until I've got a new hard drive which hopefully should arrive today... and then I'll have to re-install the operating system... the software... get the settings sorted out. Sigh. Never mind. 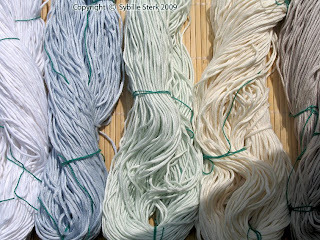 My yarn dying experiment with the beautiful bamboo yarn was a big success yesterday. I managed to get a variety of shades of mermaid (jade) green/blue and it's drying as we speak. Once it's dry I'll take some pictures. This time I didn't forget to take some 'before' pictures. Not a good week for me... my hard drive is trashed, and although I still hold some very small hope that I might recover some of the data on it, the hope is slim. 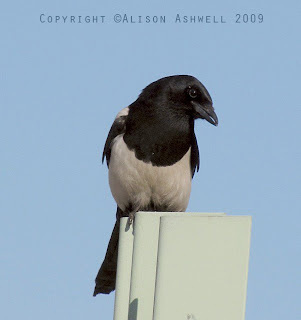 The good news is that at least all my photographs and paintings are on the external hard drive and therefore safe, but the bad news is that it will take at least till Friday to get my computer back to working order. So, instead of spending another day moping around I'll be dying some bamboo yarn today for my next project. I am also still working on my silk/linen top which was giving me trouble as I can't follow the pattern with my yarn being so different from the pattern. Never mind, it'll get there. Fingers crossed everything will be back to normal soon. Finally finished - not that it took me very long at all really as I only started it a week ago. ... with dark clouds around it - how else could you see the rainbow? This shawl is a present for my marathon running friend Caroline. She hasn't seen it yet, so shhhh! 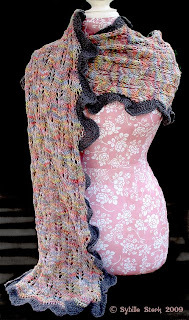 It's a really versatile shawl that can be worn different ways. The pattern is from a knitting/crochet techniques book and is called 'Flickering Flames'. The border and design is my own idea and the rainbow yarn is from one of my favourite shops on Etsy: Tulle And Dye. It's a re-dyed Debbie Bliss Baby Cashmerino. The grey yarn is rough silk and has almost a lavender tint to it. 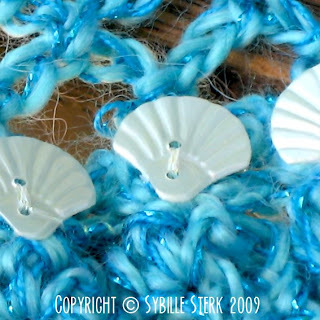 Here is the yarn in more detail. It was fun and interesting to make - not too taxing but not boring either. 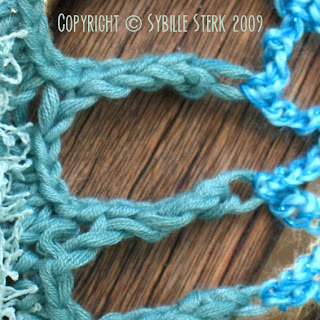 I love the contrast of the two yarns and it drapes really nicely. 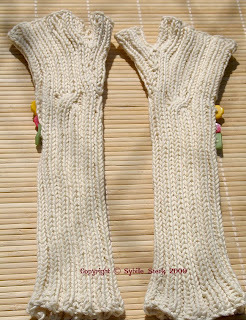 Here are - as promised - the pictures of the wrist warmers and shrug I made for my sister. I hope they've arrived now. My sister wanted a pair of white wrist wamers. 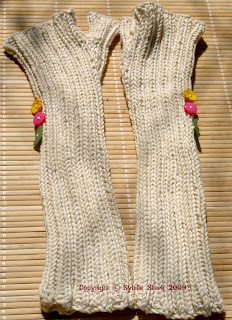 I thought really, really white would be totally impractical so made them in Sirdar's Just Soya in a vanilla cream colour. 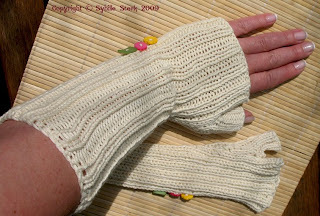 They are very simply knitted with a ribbed pattern and one single cable to hold their shape nicely around the wrist. A few buttons in my sister's favourite colours jazz them up a bit. 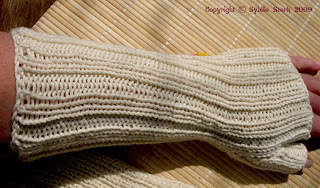 The Just Soya yarn (really, it is made from soya) is one of the nicest yarns I've knitted so far. 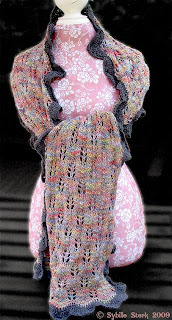 It's soft and holds its shape nicely and it looks great knitted up. I can only recommend it. 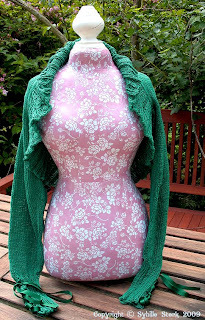 It took forever and a day to find the right colour in cotton for this shrug. 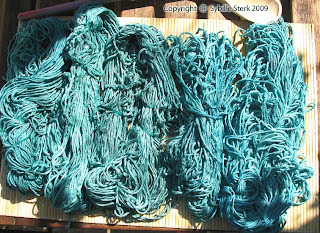 I ordered a few green yarns from the net before I managed to find this on www.yarnstick.com. 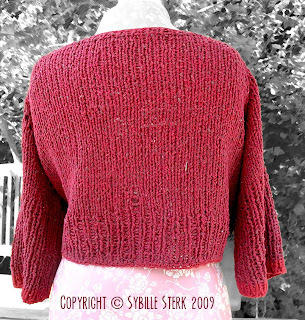 The shrug is knitted starting with the cuff, then all the way up to the shoulder with half the back. Then I did the same for the other side and grafted them together with Kitchener stitch. The cuffs have button holes for the satin ribbon laced through it, which looks pretty but also means the cuffs can be adjusted for various wrist sizes. The back also has button holes and satin ribbon laced through. Shrugs of this design often slightly balloon out at the back and this allows a nice snug fit that can be adjusted as required. 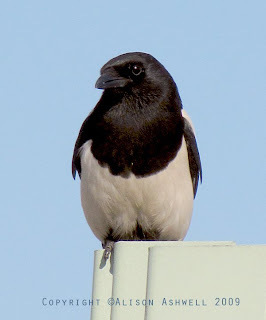 The collar was knitted separately by picking up the stitches all around the opening (and took forever as there were so many stitches, especially as the stitches increased every so often), but again, it looks nice and makes it easier to wear. 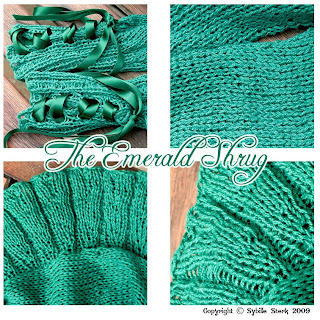 The yarn is the most gorgeous (true) emerald green and was held double. It was lovely to knit with and drapes nicely. I am currently working simultaneously on a present for a friend and a top for myself.